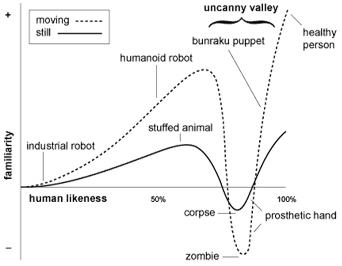 Although he didn't invent the concept, the term "uncanny valley" was resurrected by Japanese roboticist Masahiro Mori in his 1970 essay "The Uncanny Valley" (translated from Japanese), where he described in detail the alienated reactions that humans have to robots or androids who look too human-like (artificial skin, hair, animatronic faces and limbs), as opposed to human reactions to robots that do not try to appear human at all, and posses no human-like features, which are often instantly positive, empathetic and warm. Mori's theories have become more and more important as robot science and robotic engineering have become acceleratingly widespread, particularly in Japan. Mori actually commandeered the term from Ernst Jentsch, who coined it in his 1906 essay "On the Psychology of the Uncanny" ('Über die Psychologie des Unheimlichen'), which explored the thought processes humans go through within the boundary line that divides the familiar and the unfamiliar. These ideas were more famously expanded upon by Sigmund Freud, who wrote of them in his 1916 essay "The Uncanny" ('Das Unheimliche'). Of course, these days, things are a bit different. Once exposed to the uncanny, it eventually ceases to be so. And in our age of overly-developed communication technology and sensory exposure and overload, the instance of truly contradicting semiotics seems less and less likely. Today, fewer things seem genuinely "alien." Two years ago, while doing research for an article I wrote about living with a Japanese home robot, I had a fascinating phone conversation with Sara Kiesler, Professor of Computer Science and Human-Computer Interaction at Carnegie Mellon. A bit of a celebrity within the field of robotics on this side of the globe, Kiesler has, amongst other things, spent years in research with this exact topic. She spoke about how human characteristics in robots can often have a simple communicative purpose. A robot who extends an arm-like appendage to hand you something acts as information, you know what it is trying to do. Robots with no human features at all (something that is just a sphere or cylinder on wheels, something with no head, or even a typical home computer design), that interact with people in human-like ways can be just as disturbing as robots that try too hard to appear human. But the territory of either-or is not so black and white. The simple addition of human features onto a robot that otherwise appears to be a machine, initially thought of as positive in the design of robots, can be disturbing for many. A very mechanical looking robot that has added-on a human hand-like extension on it's arm, or spherical eyes with pupils that correlate to move in the direction of what the robot is looking at, or human-like lips that move as the robot speaks, can sometimes remind people of disfigurement, strange disease, or death... mostly on a subconscious level. Conceivably, the emotional state and the complex variety of stimulus that cause the "uncanny valley" could be traced back evolutionarily to animals who developed an acute sense to identify other living things that were slightly diseased or mutated from the norm, and needed to be avoided. For the last six months I wrote a paper on George A. Romero's zombie movies. The Uncanny Valley theory also applies here. What a surprise to see this topic come up here one week after I finished my essay. The uncanny valley phenomenon was reason number three of possibly seven hundred why I hated "The Polar Express".